Semi-gloss, acrylate emulsion paint with decorative gold/silver metall effect. For interior and exterior use. The special effect coatings CapaGold and CapaSilber (CapaSilver) provide for a pure, natural gold or silver-coloured shade, particularly on textured surfaces, when used in combination with special primer EffektGrund. Individual surfaces with an attractive visual appearance are achievable with different application techniques, e.g. using paint brush, stippling board, scraper/wiper or paint roller. The required coating system (priming, intermediate and finishing coat) realises impressive surfaces with a high load capacity and is applicable on the full surface of ETICS/EWI systems. 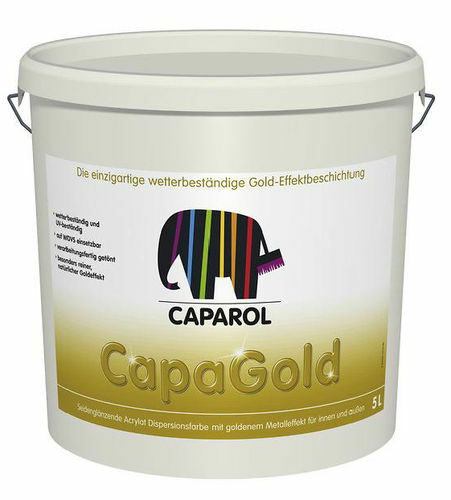 Highly pure, natural gold or silver colours. Applicable on the full surface of ETICS/EWI systems. Weather-resistant and resistant to UV light exposure. Wet scrub resistance Class 1 according to German standard DIN EN 13 300.